It had been known from the time NR had been introduced as a plantation tree crop that rain interferes directly with the harvesting of latex from rubber trees and therefore tapping on rainy days had not been practiced. This is because the fungi which usually grow on leaves and pods enter the fresh cut along with water gushing along the trunk of the tree, causing bark rot. Also it has been known that the rubber smallholders in the traditional Low Country Wet Zone can reap only 45% of the total yield due to this problem while the RPCs in the same areas used to get about 55% of the total yield by practicing what is termed as double tapping, which has its limitations. The rain guarding technology was developed in the last century in order to minimize the adverse effects of rain interference on tapping. Initially, a polythene rain guard, similar to a plaited skirt in appearance, was fixed to the trunk of the rubber tree using a special adhesive that was not expected to melt or crack in any weather, although this had not been achieved fully. Although, this system had been in practice, where ever the grower was willing, since several years ago, yet this system is still being debated, with the existence of two schools of thought, based strictly on their personal experiences. One school of thought believes that one of the solutions for improving rubber tapping process is the use of Rubber Rain Guards. This, they say, offer a proven economical solution for improving the yields in rubber plantations. The design of Rubber Rain Guards available in different rubber growing countries has been made to ensure improved yields with products which are easy to use for plantation workers. Given the proven benefits for plantation owners, they say, Rain Guards are being used in plantations across the world. Programs have been implemented in many countries including Ivory Coast, Nigeria, India, Indonesia, China and by some in Sri Lanka. The objective is to increase the income by reducing production disruption caused by rain. Rubber Rain Guards are fixed above the tapping panel all around the tree so as to divert stem flow of water protecting tapping panel and bark area. It provides sufficient aeration to the tapping panel so that the chance for fungal growth is negligible. It also protects the latex collection cup fixed under tapping panel. Increased production yields depending on the plantation location and efficiency, improvements of 25 to 40% have been made. (2) Easy-to use: Rain Guards can be fixed with staples, screws or glue and a variety of sealants can be used when required. (3) A wide range of sizes available to best fit the trees sizes and requirements. Around 140 days of tapping is lost each year as a result of rain interference. Since one tapping block is recommended to be tapped once in two days, the loss of tapping days in a tapping block is around 70 per year. On an average a tapping block consists of around 300 trees and gives a yield of around 9kgs per tapping. Therefore, for 70 days the loss of crop is about 630kgs. The current price of a kilogram of natural rubber is around Rs. 400 and hence the monetary value of the rubber not harvested due to rain is around Rs. 252,000 per annum per tapping block. This is a significant loss for both land owners and the tappers. If the value of rubber not harvested from a single tapping block is Rs. 252,000 per annum the loss to the country from the entire rubber plantations is estimated to be around Rs. 25,452,000. The rubber growers on their own react to this situation in a number of ways. A popular approach is to tap the rubber trees continuously when weather conditions permit to do so. As a result, a tapping task is tapped continuously during dry months. With this method the desired objective of the land owner, i.e. recovering the crop loss due to not tapping in wet days, cannot be achieved. This is because once the crop is harvested from a tree a certain period of time should be given for it to re-synthesize the latex prior to harvesting it again. This is why a rubber tree is recommended to be tapped every other day. Therefore daily tapping results in severe stress to the rubber plants. Daily tapping leads to a lowering of the dry rubber content of latex and in such trees if tapping is undertaken continuously it leads to cessation of latex production. This situation is referred to as Tapping Panel Dryness(TPD) and in the rubber plantations in the country this incidence is high as 15-20%, now, a very discouraging factor as the issue still remains unresolved. Undertaking late tapping is another strategy the growers adopt to minimize crop losses due to rain interference. 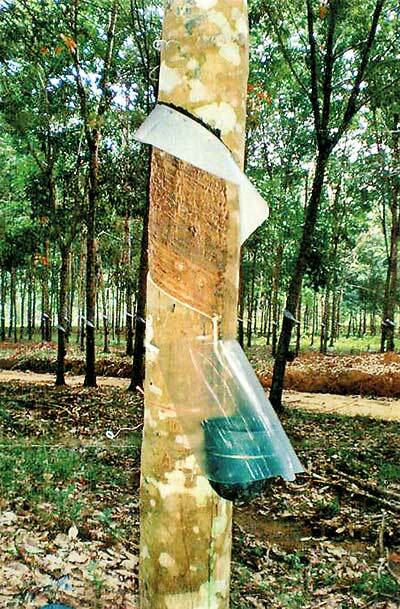 Late tapping is commencing of tapping late in the day once the wet panels of rubber trees have dried-up. In this manner, about 40-50 out of about 140 tapping days lost per annum due to rain could be recovered. Nevertheless, late tapping results in about 25% loss of crop when compared with normal tapping. When considering the number of tapping days we are able to recover and the crop loss on such days, this approach is not a complete remedy. However, it is a better method than undertaking daily tapping on dry periods of the year. But it is also known that the tappers are reluctant to undertake tapping on late tapping days. During rains, the water that is collected on the canopy of tree, comes down seeping along the trunk. During the process, the mosses found on the trunk of the rubber tree, absorb part of this water. The water absorbed by mosses in this manner is released only gradually. Thus the tapping panel of the tree remains wet for a considerable period of time even after the rain has seized. This situation could be avoided by grooming, i.e. the removal of the mosses by scraping the trunk on upper, lower and lateral sides of the tapping cut. This quickens the drying up process of the wet panels. But, this method is very rarely adopted by the rubber growers. The rain-guarding technology is generally accepted as an answer to the problem and is widely adopted in the rubber plantations of our neighbouring country, India and also in many other countries such as Vietnam. Among the rubber growing countries in the world, the land productivity is the highest in India and the use of rain-guards would have contributed to this significantly. Though the use of rain-guards is on the increase in the country, it is still at a lower percentage of the total extent. An encouraging trend is that those who have realized the gains from this exercise continue to adopt it each year. Vietnam, another very good example. A major issue is that rain-guarding results in the condensation of water on the tapping panel. This leads to infections and tapping panel dryness. The condensation of water is said to take place due to the covering of the entire circumference of the tree with the rain-guard, thus preventing any ventilation. But with the correct adoption of the technology this will not arise. Some argue that even with alternate day tapping, exploiting of rubber trees without intervals of non-tapping can bring about a stressed condition to the tree and hence rubber trees should not be tapped when there is rain interference in order to provide that interval. But, it is known that tapping at alternate day frequency has no detrimental effects to the tree. If a rubber tree is stressed due to tapping the dry rubber content of the latex obtained will drop to levels below 30%, and this does not happen. However, if such a situation occurs it is advisable to give the trees a tapping rest for 6-8 days. Anyhow, even with rain-guarding about 20-30 days of tapping are lost per annum due to uncontrollable extensive and intensive rains. With the installation of rain-guards, however, the area of the tree covered by the rainguard will remain dry whilst the other areas of the tree will remain wet during rainy periods. Also, the estimated gains from this to the rubber tappers will be much more than the disadvantages if there are any. Therefore, the rubber land owners should motivate the latex tappers to use rain-guards. This could be done by providing them with raincoats, leech repellents and also paying an incentive for tapping on days. In some instances though the landowner is for fixing rain-guards there are certain constraining factors. Non-availability of the rain-guard sealant and lack of skilled workers for fixing. The fact that the landowner had to invest about Rs. 60/= on a tree also, appeared to have been a discouraging factor, but now the GOSL provides a subsidy of 50% ie Rs 30/= for fixing rain guards. Four types of rain-guard, viz. polythene skirt, ‘Tapping Shade’, ‘Guardian Rainguard' and ‘Tapping Shield' had been in practice in the country. During North-East monsoon period, there will be leakage from rain-guard on many trees. This can be prevented by fixing a mini rain-guard of 3 inch wide LDPE sheet using rain-guard compound just above the current year’s rain-guard during the month of August-September. Although rubber growers in the country are convinced of the benefits of Rain- Guarding technology, but they are still not convinced of the success of the technology available in the country. Here lies the actual problem.